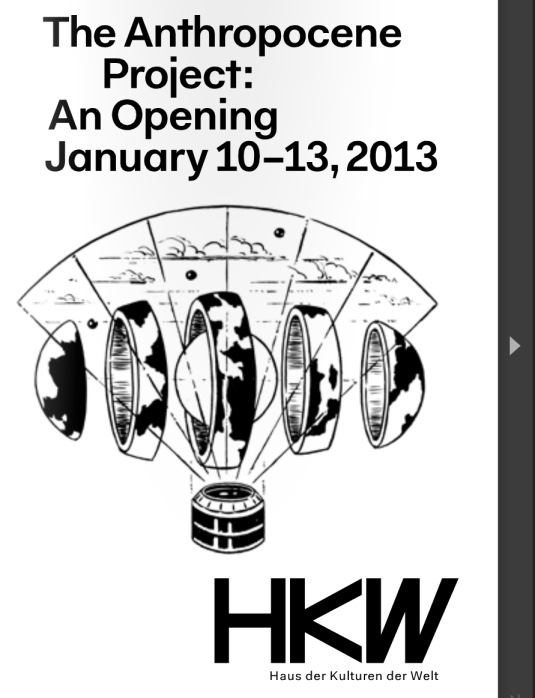 An ambitious initiative ‘The Anthropocene Project’ opened last week involving leading thinkers, scientists and artists, from a range of disciplines coming together for an innovative two year study 10.01.2013 – 31.12.2014, curated by the House of World Cultures (Haus der Kulturen der Welt) in Berlin. This is an important, albeit overdue, initiative in that significant cross-disciplinary activity across the humanities is finally linking with science at such a high level. Sociologist William R. Catton Jnr, who as early as the mid 1980s established that humanity was ‘overshooting’ its planetary boundaries (in his highly regarded book of the same name), also identified as a chief difficulty of our age the ‘cultural lag’ of contemporary society in realising the urgent necessity to engage in overshoot concerns, despite decades of scientific information supporting such views. Robust eco-literacy in the humanities is also overdue, if only to facilitate the beginnings of understanding that the Earth’s degradation is not just a result of resource exploitation or humanity’s large numbers, but ultimately driven by the anthropocentric-dominant, cultural paradigms of industrial society, that have greatly blinded our acknowledgement of the intrinsic values of, and inter-dependencies we have, with other non-human species and ecological systems. In one of many upcoming seminars of the project entitled ‘Island Perspectives, focusses on ‘how do we see in the Anthropocene?’, past president of the Association for Study of Literature and the Environment (ASLE), Professor Ursula Heise, is involved as a key note presenter. I had the good fortune to meet Ursula briefly after her fascinating keynote speech that ecocritically examined Japanese animated films, at the 2012 ASLEC-ANZ conference on Regarding the Earth in Text and Image last August (I had a brief opportunity to discuss with her why there had been such a lack of activity in film theory on ecological concerns). In other seminars, notable scientists such as Will Steffen of the Australian National University’s (ANU) Climate Change Institute, who has done much to collate and publicise the Earth’s interconnected planetary boundaries – ‘tipping points’ (information known and accepted before the UN Rio+20 Conference last year). People such as Steffen and the stratigraphers (geologists) who conceived and are involved in the ongoing debate to define the term ‘Anthropocene’ from a geological perspective contribute to the core of those involved in the Anthropocene Project. (See Will Steffen’s Anthropocene TedxCanberra talk here for an understanding of the science behind the term Anthropocene). I reviewed some of aforementioned scientists work in an unpublished article last year that I titled The Anthropocene: 10 000 years of ecocide (Fitzgerald, 2012). I was interested in thinking about how to characterise a ‘western anthropocentric gaze’, how it may be related to the ongoing ‘slow violence’ of ecocide through the millenia. I also examined the ongoing geological debates around the term ‘Anthropocene’, discussed the short 2012 online ‘Welcome to the Anthropocene’ film and the international resource website anthropocene.info created as a vehicle for the large international, Planet under Pressure, 2012 conference that was held for scientists and economists in London last March. Some have remarked that the need for humanity to move to an ecological and deeply sustainable worldview is as great a change in planetary perspective as Copernicus’ theorems and diagrams. I therefore take the view that the publications from the new Anthropocene Project, from the wide range of events planned over the next two years, will be critically important and I am hopeful that they will filter into universities and colleges soon. However, I do have some concerns about the rapid adoption of the term ‘Anthropocene’. For example, I have found some of the language in the Anthropocene Project document almost too anthropocentric. We humans too often forget we are just one species, cohabiting with (though it’s difficult to say this with our species effecting the largest extinction rate against other species in millions of years) and dependent on non-human communities. We tend to overlook all too easily the fact that previous human civilizations often failed due to lack of resources and/or ecosystem collapse – situations that were similar to those developing now except the enormity of today’s degradation, caused by our exponentially accelerating population and material consumption, seeks to disrupt not just a bioregion but much of the planet. The second sentence describing the Anthropocene Project ‘that humans make nature’, is a position I recognise commonly held in the humanities and perhaps held by optimistic individuals that believe technology will be developed in time to avert these global predicaments. While our species may have achieved seemingly brilliant technologies to design and shape our environments and lives today, Homo sapiens (the ‘wise’ species) fundamentally does not ‘make’ nature, other species (our gene-swapping technologies can’t remake extinct species) or come close to replicating the complexity of earth’s biospheric and atmospheric systems. The quick adoption of the ‘Anthropocene’ term from geology into wider society in just a few years, before the term even achieved an accepted definition in Geology, does show that the ‘Anthropocene’ term does well to capture our growing recognition, that our one species, has and continues to have the power to radically change the earth. However, to me, as I have discussed elsewhere, the term also conveys a position (and this comes across in some text of the new Anthropocene Project), that our species is somehow ultimately superior and that the negative effects of our collective, unchecked activities, are somehow solvable. As in amidst the noise created by our clever technological gadgets, we must remember that from across all scientific fields, from terrestrial ecology to atmosphere climate science, mounting evidence collected over many decades overwhelmingly supports the view that our species has very little to feel superior about. Some leading thinkers in this area are also less than confident in ‘technofixes’ and support the need to radically and urgently (within the very next few decades) adopt an ecological paradigm much at odds with much of our currently accepted political, economic dogmas and our land and ocean practices. Some too are now acutely aware that the survival of Earth’s species, including our own, is critically dependent on the well-being of a vibrant biosphere as a totality. Coupled with the knowledge that our species does not have the capability to independently create such a biosphere, we can perhaps be confident that the key participants involved in the Anthropocene Project over the two year period will keep sight and evolve a discourse mindful of our place as an equal partner in the material Earth and its living communities whilst also been aware of the pitfalls of adhering too much to an ‘anthropocentric’ gaze. 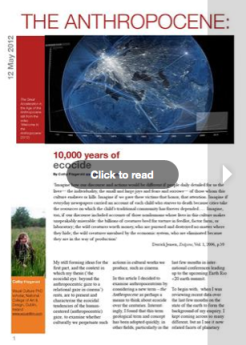 This article was first posted on the ecocinema enquiry on 8 Jan, 2013. Terrific post! I too am troubled by the claim “humanity forms nature.” Clearly the relationship between the human and non-human worlds is multi- rather than uni-directional.